The Macatawa Area Coordinating Council (MACC) constructed two Best Management Practices (BMP) demonstration sites for water quality improvement in the Macatawa watershed in 2007. The projects were funded by a Great Lakes Basin Program grant with local match from the Ottawa County Road Commission (OCRC) and Michigan Department of Transportation (MDOT). The sites are located near Zeeland on OCRC and MDOT properties. Niswander Environmental was contracted to design and implement the BMP demonstration sites. This portion of the watershed is a mix of residential and agricultural development and contributes large amounts of sediment to Lake Macatawa. Therefore, the sites were designed as bioswales retrofitted into existing stormwater conveyance systems owned by the transportation agencies. The bioswales will aid in improving water quality to Lake Macatawa tributaries by reducing erosion and sediment loading that was occurring at these locations. The OCRC site was previously an erosive stormwater outfall adjacent to Noordeloos Creek. The outfall was severely eroding the bank of the creek and causing significant sediment deposits within the creek itself. This outfall was reconfigured to flow away from the erosion area into a newly created bioswale. 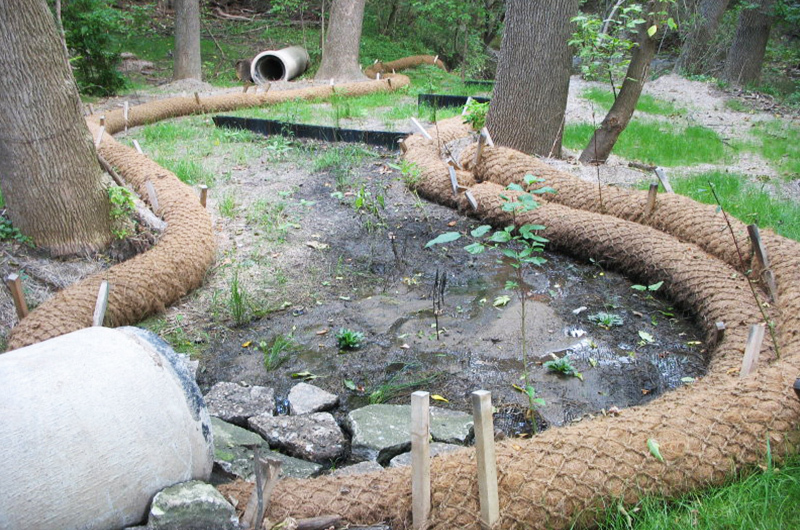 The bioswale was stabilized with high velocity mulch blanket, native plants and shrubs, and with coir logs that were installed along the entire length. Porous berms were placed within the bioswale to direct flow and slow water velocity. The large erosion scour created from the original outlet was filled in and stabilized. The MDOT site was originally a narrow, degraded ditch alongside I- 196. In order to drain to the adjacent stream the ditch requires a severe turn which was causing erosion in this location. In addition, the ditch was previously dominated by cattails and purple loosestrife. To eliminate the erosion and enhance the existing wetland within the ditch, the ditch was retrofitted with a bioswale. The bioswale construction included removing the invasive species and installing high velocity mulch blanket, native plantings, and coir logs as natural check dams to slow water velocity. In addition, the riprap that was previously scattered at the curve of the ditch was replaced in a more appropriate location. The erosive curve of the bioswale was softened and lined with coir logs planted with shrubs to stabilize the water flow. Willow stakes were also installed within the riprap area to further stabilize the flow as it exits the site. Not only do these sites provide water quality improvement within the Macatawa Watershed, but they also provide outreach and educational opportunities regarding water quality for students and the general public. The Macatawa Area Coordinating Council also intends that these sites be utilized by public agencies to exemplify how natural measures can improve the quality of water leaving a site.